Having got the engine out of the car the remaining ancillaries and intake manifolds etc were removed from the top of the engine, leaving us with what is known as a long block. It was pretty dirty with oil residue from various leaks over time and a nice coating of Castle Coomb grass! for good measure. We borrowed an engine crane and loaded the engine into the car, taking it over to Archer Motorsport Services in Hertfordshire. With some much appreciated help we were able to dismantle the engine in just under three hours. The aim was to identify the root cause of the failure, determine if the engine is even rebuild-able or just scrap and form a plan on what to do next. Working on cylinders 1-3 first the cam covers and camshaft assembly came out pretty easily. Next the cylinder head bolts are removed and binned. These are single use so have to be replaced regardless. Inlet and Exhaust camshafts above connected by timing chain. The valves and pistons on this side of the engine looked pretty good. Also there is no sign of bore scoring in the cylinders and only light carbon build up on the pistons. Moving to the sump we found evidence of a destroyed bearing shell. A lot of fine particles in the oil residue and some larger pieces of metal on the magnetic oil pickup - which isn’t good. On the cylinder 4-6 side, again the valves and camshafts were the same as 1-3, but removing the cylinder head we could immediately see the piston no.6 was loose with no big end bearing left. This was the cause of the knocking when the engine ran. 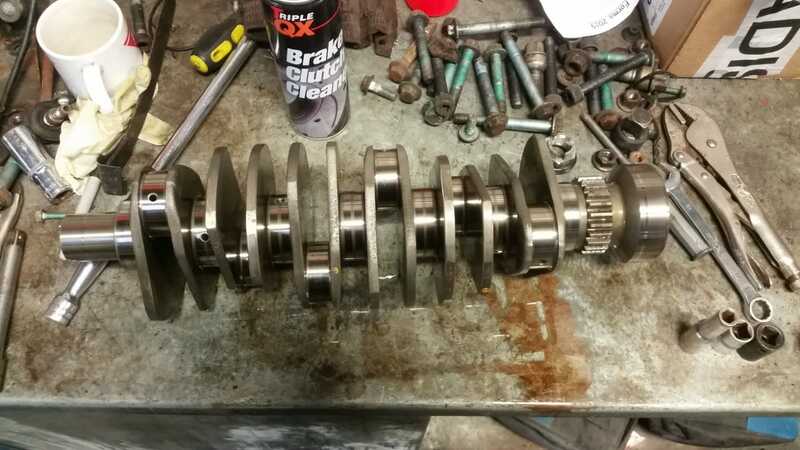 The lack of a bearing shell has caused the conrod to damage the crankshaft surface. This is beyond the amount that can be ground so its scrap. Crankshaft removed - spot the damage! It has also caused some scoring of the piston in the cylinder bore as there was too much play going up and down in the cylinder. Cylinder 6 is renowned for oil starvation issues in these engines. It is the furthest from the oil pump. This cylinder was showing low compression when we tested the engine a year ago. It’s a marginal call as to whether to rebuild the engine or replace it with a used engine. With a used engine likely to have at least 70-80,000 miles there are two considerations. We think therefore it is worthwhile trying to rebuild our engine. To do this we need to source a good crankshaft first. Then we can get cylinders 6 (and possibly 5) re-lined using either steel or Porsche Nikasil liners. The head will need to be skimmed and the valves lapped, then it can be re-assembled with new consumables, bolts, gaskets and bearings. Re-assembly should take a day. 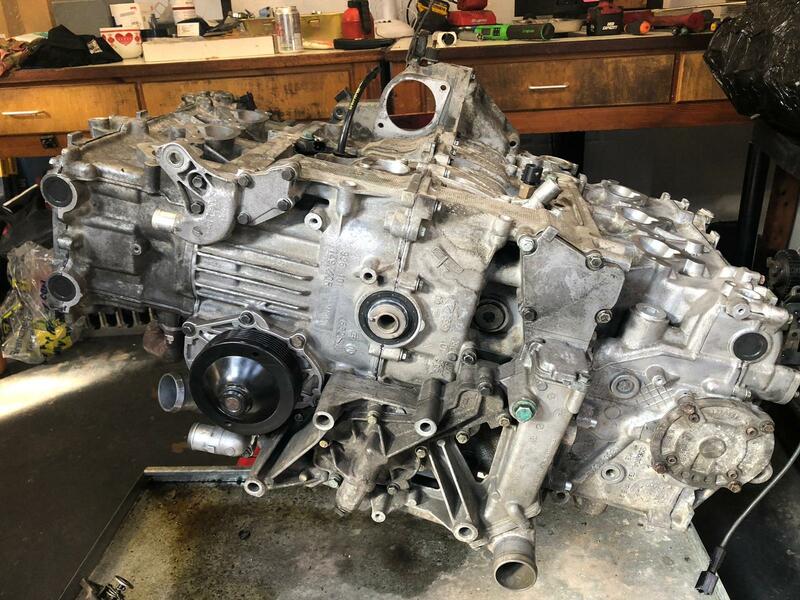 Through careful sourcing of the parts we need this should be only marginally more expensive than a used engine - but giving up the piece of mind and greater assurance over the condition of the engine at the end of the process. 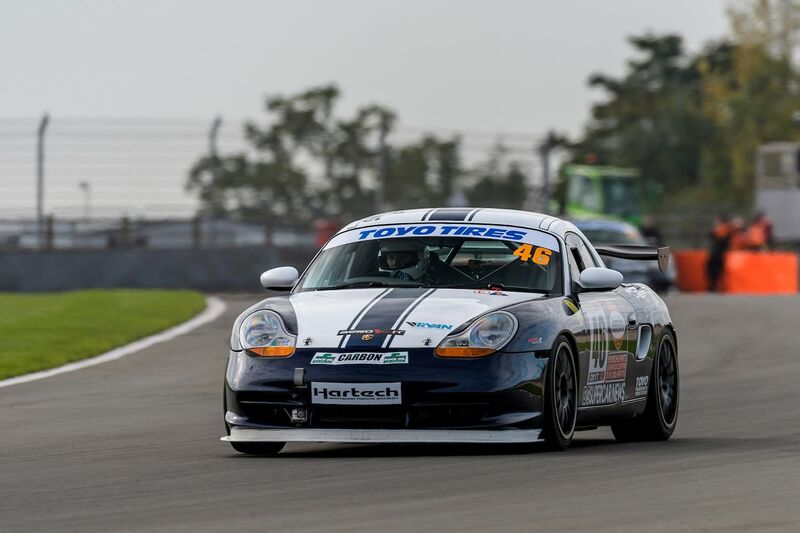 After around 30 race weekends, plus track days and testing in between the internal bearings called time on the constant high rpm and back acceleration that is involved for a competitive race engine. A hour earlier we were mulling over a good but slightly perplexing qualifying. I had gone 2 seconds a lap faster than ever before around the Donington Park national circuit, but somehow ended up 10th on the grid. With the benefit of testing (2 days for some) everyone else just went 2.5 seconds faster! The temperature was rising as the afternoon kicked in so we needed to reduce tyre pressures and the rear end was a little unstable under braking in qualifying so a tweak of the suspension was needed. Nothing else to report other than looking forwards to a great race, which was setup with 5 cars capable of winning and another similar group behind. I leave the engine running in the holding area to ensure it’s fully up to temperature and we head out on the green flag lap. It’s a little slower than usual and I’m weary I have new tyres which will come up to temp quickly. I reacted quickly as the red lights went out, but the car in front didn’t. Jinking to the right I realised there was only half a car width of race track and didn’t fancy getting on the damp grass under full acceleration so backed off. The car behind jinked left making several places and went on finished o the podium. Two cars tangled and went off first lap and the top 10 was pretty close through the first 3 laps with me watching at the back of the pack. It started to stretch out over the next few laps but I was nicely in touch with the two cars in front coming right onto them every time they made any mistke or held each other up. Coming down the fast final straight I felt a slight rumble fro the engine under braking and then there an almighty vibration, shaking the car as I tried to accelerate out of the last corner. I'd never had an engine go on me before, but it was obvious our race was over. I switched it off immediately wanting to avoid as much internal damage as possible and pulling off to a safe place at the side. As the race went on no less than four additional cars broke down or pulled off with mechanical issues. In seven race seasons, this is only the second time that we have had to pack up early, with no hope of running in the later races. But as frustrating as it feels, our engine has never let us down and been far more reliable and performant than many others since we started.